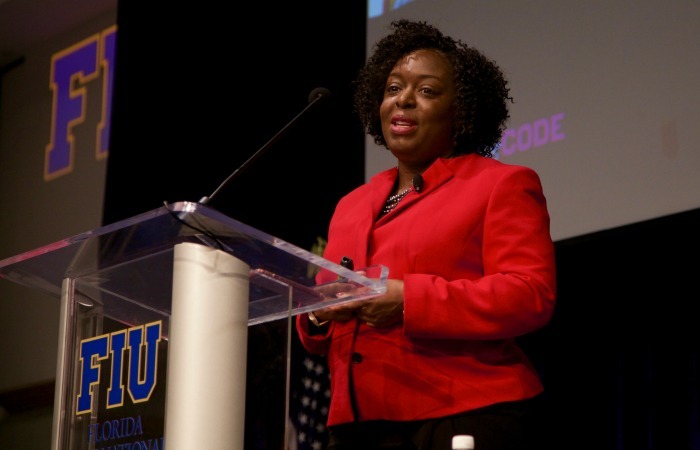 Kimberly Bryant, CEO and co-founder of Black Girls Code, served as the 2016 keynote speaker at the Women Who Lead conference. In 1984, 37.1 percent of computer science degrees were awarded to female students. By 1998, that number dropped to 26.7 percent, according to Colorado School of Mines. Today, only 12-14 percent of women receive bachelor’s degrees in computer science. For women of color, the figures are even lower: African-American women make up approximately 3 percent and Native American and Latinas only an estimated 1 percent. “There are detours on the way to your professional goal, but they all influence your career in the future,” said Nadege Green, reporter for WLRN South Florida. “I was the girl that majored in everything before finding the right fit. I had to major in anthropology to realize that wasn’t what I wanted to do.” She pointed out, however, that she grew up as a classically trained ballerina, and today she is passionate about reporting on the arts. For Kimberly Bryant, CEO and co-founder of Black Girls Code, her decision to start a coding school was fueled by her daughter’s desire to learn how to code in an environment that was more diverse and inclusive. Today, her mission remains to give more minority girls the chance to be part of the tech industry. In her keynote speech, Bryant shared the vision of her nonprofit: “The work with Black Girls Code is more than teaching girls to code: it is breaking inequities in the workforce and how we use technology to do that.” The key, she stressed, is creating an early-entry pipeline. “Teach them about coding and technology, and give them a pathway. Empower them to become tech creators,” she said, pointing out that women dominate consumption and purchasing of technology, but have little presence in the industry as a whole. Her goal is to change that, and she plans to do so by training 1 million girls to code by 2020.